STIPULATED, certain commentaries are harder to delve into than others. Alas, this one is more enraging and urgent than most. Where, oh where to begin? BRIEFLY, definitively, in relation to stealth jihad, its knock-on blows “fly under the radar.” In turn, its after-effects morph into a higher threat level. Insidious. In fact, since said dangers are “hiding in plain sight”, they are able to metastasize without any push-back. By extrapolation, a very distressing situation emerges and a circular pattern evolves, despite its eventual reality as a high priority danger. Not only that, oftentimes, it is akin to entering bizzaro-land, a through-the-looking glass world where up is down, black is white, evil is good, and so on and so forth. Simply put, it’s the nature of the Islamic beast. IN this regard, countless Americans and Canadians (westerners at large) pay little attention to less than top-tier, off the charts reports, in so far that said reportage is few and far between. Making matters worse, there are so many wildfires – many of which are raging at the same time – who can keep up. Regardless, it is urgent to get with the jihadi program. Rest assured, ignoring said “non-news” will be very costly. Deadly. AS to the latest “under the radar” thrust, who but front-line law enforcement should stand as bulwarks against militant jihad, whose sworn mandate is to protect and serve? Who, indeed. EVEN so, before we segue to Canada’s most recent nail in the (western) coffin, it is certainly the case that America’s law enforcement – local and Federal – is beyond infected and infiltrated. Most perniciously, the Muslim Chaplain’s program within the U.S. prison system is wildly dangerous. No doubt, it should be coined: terrorism’s prison connection! Un holy jihad. 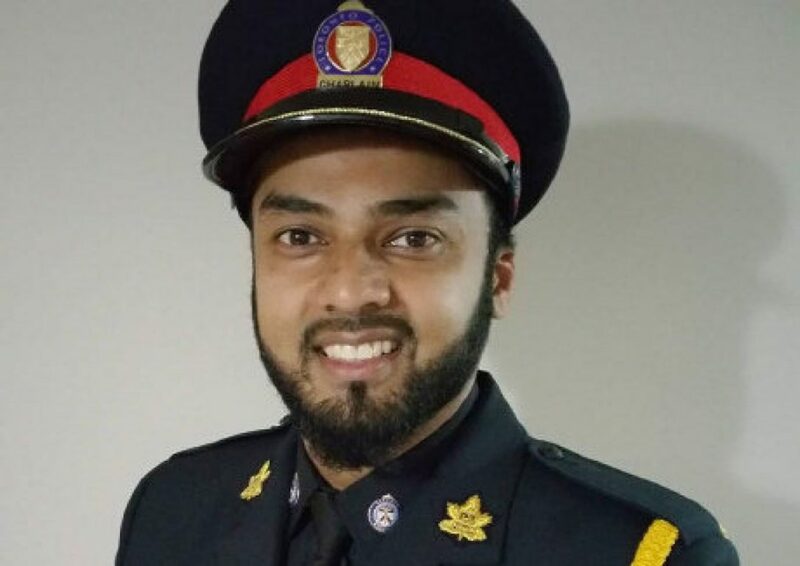 The Toronto Police Association is raising concerns about the police service’s newest Muslim chaplain Musleh Khan and his views on women and marriage, the Toronto Star reported. As part of his activity for Pure Matrimony, Musleh Khan held in March 2013 a webinar entitled ‘The Heart of The Home: The Rights And Responsibilities of A Wife’. According to Musleh Khan, the husband is the only leader of the family; “the wife should be obedient to her husband at all times” including when he calls her to bed; she should “ask her husband’s permission before leaving the home” and “is obliged to serve her husband.” To read the transcript of Khan’s webinar click HERE. “My purpose here for you is to really take you through a journey. Basically, it’s a journey through an individual that is very dear to us. “A person that we love. A person, if he was to walk through that door this very moment, we would go and surround him. And if we could, we would pick up his shoes and carry it for him. “And we would try to replicate everything that he does. So if he sits down, no one, we would never sit down unless we see him do it. “Eventually later on in his life when this wife [Khadija] she passes away, and [Mohammad] gets married again. “He [Mohammad] marries a woman by the name of Aisha, my Allah be pleased with her. Aisha was much younger woman [9-year-old girl]. So there’s a lot of interesting things about her that we learned and we we really get from his whole life story with this one particular wife. “Aisha, she was young [9-year-old girl]. So she didn’t really understand what marriage, what it took for a woman to be in a marriage. She didn’t really understand the maturity or the responsibility of being in a marriage. “So why is that important? Because what this should indicate that one party, so in this case it’s the husband [Mohammad]. The husband got to be somebody that’s very tolerant and he’s got to have wisdom. He’s got to have wisdom and how to speak to a person like this [9-year-old wife]. How to build a relationship with an individual like this[9-year-old wife]. “So nobody had better wisdom in being a husband than the Prophet Mohammad peace be upon him. “So imagine now he has this wife [Aisha]. She’s young [married to Mohammad when she was 9 years old]. “So one day. He’s riding a horse, and she’s riding a horse, and they’re beside each other, and he is, all of his followers his companions are all ahead of him. So he says to the companions: go ahead, move forward and go ahead. So they do. They go ahead and they leave the Prophet and his wife by themselves. So he tells his wife get off the animal, get off the horse. So she gets off the horse and he gets off the horse too. And he says to her: stand beside me. So when he stands beside her, he says to her: OK, ready, set go. And he starts to race her. Imagine, this is the Prophet of Allah and he’s going to race with his wife. So they’re racing and his wife beats him. She wins the race. So when eventually the prophet stops he is like OK no problem. Let’s get back on the horse and let’s continue. “A few months go by, they’re on the same journey, they’re in the desert and he’s on a horse, she’s on a horse, the companions are there. So the prophet says to the companions: go ahead and leave me and my wife alone. So they do that, and he tells the wife: OK let’s get down again. So they get off the horse a second time. So he looks at his wife and he says: on your marks, get set, go. This time the prophet wins this race. “What happened to his wife is that eventually as the months went by she started to gain some weight, she got a bit slower and she became older and so on. So the prophet tells her: this time I won and you lose. “So brothers and sisters and my guests here today, the Prophet, peace be upon him, was not only an example for all of us, but I hope and I pray that all of you sitting here today could see that he [Mohammad] was also an example for all of you. “We love this person [Mohammad]. We love everything about him. We love the way that he was described and how he even smelled. He had, some of the companions describe that the odours that would come from the Prophet peace be upon him were sweeter than the sweetest musk that you could ever find on the face of the earth. His sweat was used as perfume. We believe that these are part of some of the miracles that the Creator gave him, certain attributes about him that separated him from everyone else. “For my non Muslims friends, thank you for being here this evening, and thank you for not turning on the T.V. to find out who we are, and thank you for not going on an internet website or opening a newspaper, or a magazine to see who the Muslims are. “Thank you for being here amongst Muslims. Thank you for being here amongst women who are proud to wear their scarves, and thank you for being amongst the brothers and sisters who are proud to say that I believe that there is no god worthy of worship but Allahand that the Prophet Mohammad peace be upon him is his servant and final messenger….continue reading…. YES, in order to internalize the inherently grave dangers associated with hiring a Sharia compliant Muslim Chaplain for a western police force (let alone, for the most populous city in Canada, Toronto…. elsewhere alike), it is urgent to internalize what Muhammad, the “supreme” role model for all Muslims, stands for. Intrinsically, without this clear understanding, one cannot recognize what lies in wait from said so-called law enforcers, as they view their allegiance to Islam (Allah and Muhammad) above all else, even as Muhammadans lay swathe to the west. MOST significantly, it is impossible to overstate the threat level, especially when one connects the dots between Shariah adherent Chaplains ministering to those tasked as front-line defenders against acts of jihadi terror, let alone overall criminality! Couple this frightening reality with an already burgeoning and radicalized Islamic element within America and Canada, alongside western nations up and down the line. Incontrovertibly, Islamic foxes are deep inside (America’s and Canada’s) law enforcement’s hen house. AND if the above is not horrific enough to contemplate, imagine the nightmarish scenario of Hillary Clinton ascending to the Presidency, whereby even a British political party coined her “Islam’s Whore”. In the meanwhile, she opined: “Muslims have nothing to do with terrorism”! INDEED, the west has gone mad….going over the cliff…. This entry was posted in Uncategorized and tagged "Islam's Whore", Canada's Police nightmare, Musleh Khan, Sharia compliant, stealth jihad, U.S. Muslim Chaplain's program by Adina Kutnicki. Bookmark the permalink. Can we petition the Chief of Police of Toronto to rethink this horror? As a former Torontonian, I am horrified.